MAN Diesel’s Shanghai organisation has successfully landed another engine contract in the specialised segment for large floating cranes and construction barges. A newly designed (DLV4400) heavy-lift floating crane from Shanghai Zhenhua Port Machinery Co Ltd (ZPMC) with a 4,400 ton lifting capacity will be powered by 7 x MAN Diesel 9L32/40 GenSets. The total installed output of 31.5 MW will supply propulsion power, power for manoeuvring, for the crane activities, and to the hotel accommodation load for 250 persons. The vessel, which is designed to propel itself at up to 12 knots in trial condition, will also be equipped with a dynamic positioning system classed GL DynPos–AutR. The propulsors specified are 2 x 2,000 kW tunnel thrusters at the bow of the vessel, 2 x 2,500 kW retractable azimuth thrusters at the foreship, and 2 x 4,500 kW azimuth thrusters at the aftship. On the deck, the vessel will have a helicopter platform situated at the forecastle deck, and the full revolving main crane will be installed in the after area of deck. The hull for the DLV 4400 is expected to be built by a not yet disclosed Chinese yard, however, with the final outfitting and mounting of crane equipment performed at ZPMC’s own shipyard at Changxin Island. Mr. Zhou Ming Li, Senior Sales Manager for Offshore Business, reports from Shanghai that this record-breaking floating crane will support the still growing offshore oil and gas exploration activities in Chinese waters. Mr. Ming Li continues: “Additionally, the ZPMC organisation has in their portfolio several floating cranes. For Asia, the to date largest revolving floating crane in operation, also designed and manufactured by ZPMC, is a (DLV4000) unit with a lifting capacity of 4,000 ton. The latest repeat order for this type of floating crane is powered by a package of MAN Diesel GenSets, here consisting of 3 x 6L32/40 and 2 x 7L23/30. This vessel’s basic construction will be carried out by the Jiangsu Eastern Shipyard. In contrast to the larger 4,400 ton crane, the 4,000 ton floating crane is not self-propelled and self-navigated, but will be tugged and navigated to unlimited voyage and working zones, where it will be positioned by thrusters and anchor winches. The MAN Diesel engines for both floating cranes are packaged with alternators from ABB, and manufactured by the South Korean MAN Diesel licensee, STX Corporation. Shanghai Zhenhua Port Machinery Co Ltd (ZPMC) is a world-famous manufacturer of cranes and large steel structures. Its main products include quayside container cranes, rubber-tyred gantry cranes (RTGs), bulk-material ship loaders and unloaders, bucket-wheel stackers and reclaimers, portal cranes, floating cranes engineering vessels and large steel bridge structures. 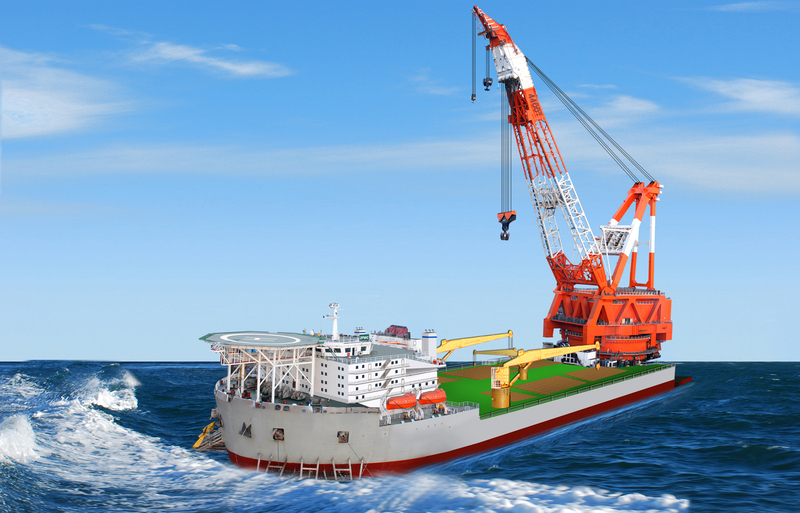 ZPMC is the only large crane manufacturer in the world that owns vessels for transportation.